Chicken Biryani is an aromatic Indian rice and Chicken Casserole. 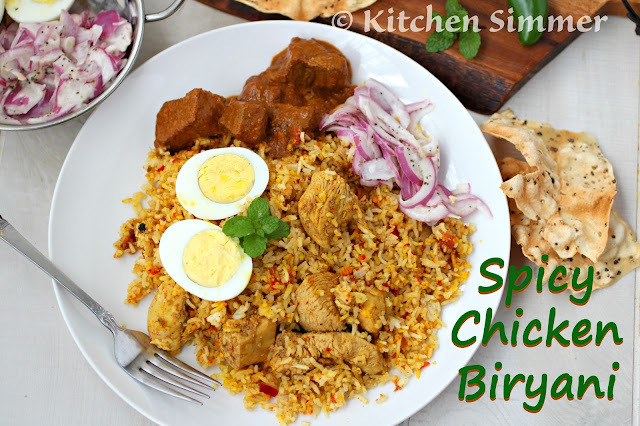 Spicy Chicken Biryani is a very flavorful and aromatic rice and chicken dish that feeds a crowd in style. My bother and sister love to entertain with a large tray of chicken biryani for parties, but they always seem to have the food catered from an Indian or Pakistani restaurant. The large tray can run up to $100 dollars and I just can't reasonably think to pay that much for some aromatic rice and chicken. I set out to come up with a recipe to make chicken biryani at home when my son, who loves chicken biryani, requested it for his last birthday. I researched on-line and realized it's was not all that complicated to make at home. I bought a good quality biryani rice and some boneless/skinless chicken breast. 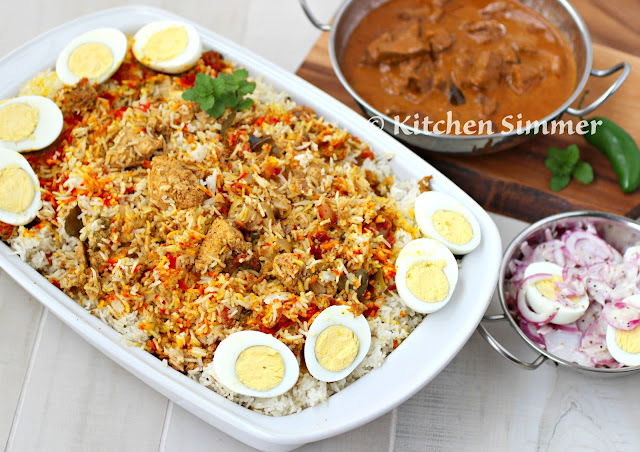 Most traditional chicken biryani dishes are served with the meat still on the bone and it does become cumbersome to eat it at a party when you are using utensils. My kids and husband prefer boneless chicken breast so I happily substituted it in the dish. The dishes actually comes together in less than 30 minutes of cooking time and about 30-40 minutes of baking time. The longest part of making my biryani is the marinating of the chicken. I recommend marinating it for at least 24 hours. I actually let it marinate for 48 hours. Once you have taken the time to marinate the chicken the rest of the process is quick and easy. If you can layer a lasagna you can layer a biryani. I did take some help from the store and bought a small box of biryani mix. There are several varieties and I have used a few different brands and they all amount to the same result. I love these mixes because they provide some of the essential and sometimes hard to get seasoning and aromatics needed for the dish. The box only costs me 99cents in the Indian store and it would cost me much more to actually buy all those spices and seeds individually. You can say frugal is my middle name. Ha! ha! My mother gave me some biryani powder from Sri Lanka that colors the top of the biryani (red, yellow and orange) This is totally an optional step to make the dish extra beautiful when you present it. You can find this powder at Indian grocers or on-line. 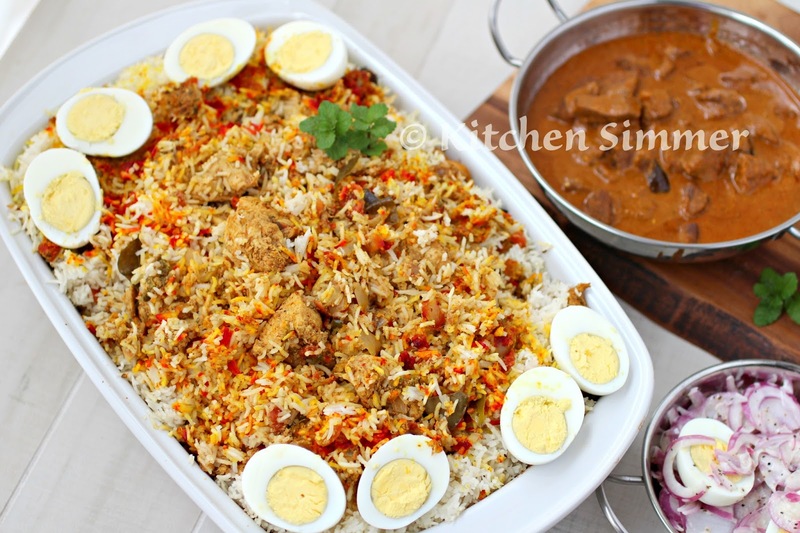 I served the biryani with some beef curry, boiled eggs, papadums and a creamy onion salad. My family loved it and I loved that it cost me only a fraction of what the restaurants would charge me. Cut chicken into large cubes and marinate in all the ingredients listed above under chicken. I placed all the chicken in a large ziploc bag and added all the spices and buttermilk into the bag. Then set it inside a bowl and allowed it to fully marinate for 1-2 days. In another pot, heat on high heat. 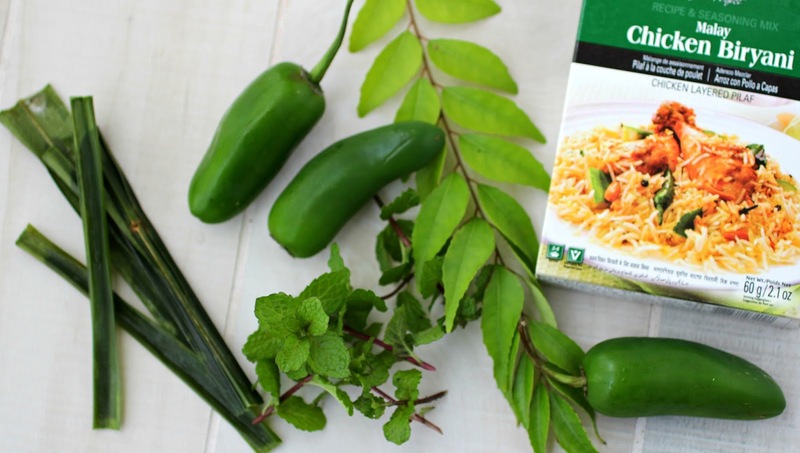 Add stick of margarine, chopped onions, curry leaves, pandan leaves and pulverized jalapeno peppers and mint leaves. Season with some salt. Cook for 5-6 minutes until onions start to turn golden brown. Then add the marinated chicken and the marinate liquid. Cook for 2-3 minutes. Next add the package of biryani powder and can of diced tomatoes. Add the water and cook for 15-20 minutes on medium high heat. Stir occasionally and taste for seasoning and flavor. Once curry is cooked, turn off and prepare to assemble the biryani to bake. Layer 3: Place half of the chicken and 1/3 of the gravy over the layer of rice. Layer 5: Layer rest of chicken pieces and 1/3 of the gravy. Optional: Sprinkle with biryani coloring powder. Oh Ramona - this recipe so reminds me of my mom's biryani! I love the cardamom pod scented rice mixed with that delicious chicken - glad you made this at home instead of ordering it - ends up being more budget friendly and nutritious too! I love rice, chicken and biryani! but did not know how to make them. Now, I know how to so I will give this a go. Thank you for sharing. My whole family love Indian! I love your step-by-step! It looks delish! This is a new one for us, I'll have to try it. This looks and sounds so good. Excited to give it a try, as I love any dish with big, bold flavors such as this. Especially love the cardamom pod scented rice. A wonderful Indian market opened up nearby so will go hunting for the mix, thanks! Awesome recipe! A classic dish! 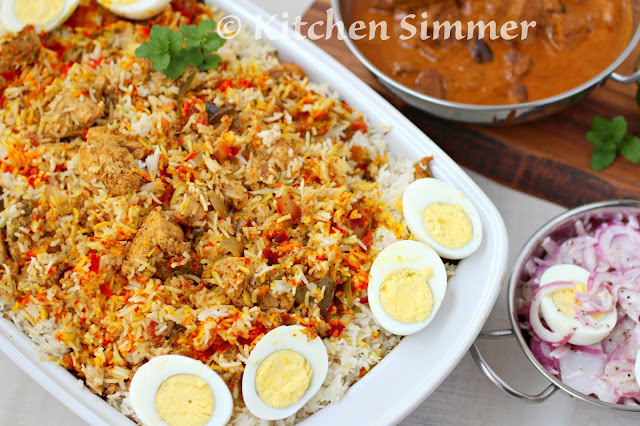 Always fascinated by how delicious and the wide variety of Biryani there is..thanks for sharing this recipe. I love biryani! But I had no idea it could be doable to make at home. Great recipe! Thanks for sharing. I bet this smells heavenly. When I was doing personal training one of my clients would always talk about making this for parties. This looks amazing!! I love biryani!! I have a separate pot I use only for Biryani :D but I love that this is made in the oven - Much easier and it looks so delicious!